This page is from the perspective of the charity seeking a corporate or business sponsor. It will discuss "where" to find a sponsor, and then "how" to get them to sign up to become a sponsor. First, an important question: How many Wells would you like if they were FREE? With a sponsorship, someone else is paying for the Well. Of course, even without a sponsorship, someone else pays for them in the form of the coin revenue. But corporate sponsors provide the full cost IMMEDIATELY, and with annual or 3-year renewals! A "sponsorship" is basically providing an opportunity to a corporation to "advertise" on the Well. It is similar to television programming allowing corporations to advertise during their shows so the shows are free for the consumers. But in the case of Wishing Wells, it is a logo or message placed on the Well. We call it a "sponsorship" rather than an "advertisement" because that fits the theme of a fund-raising device better. But make no mistake, corporate sponsors think of it as advertising...the very best kind because it is INSIDE the most valuable retail spaces in town, it is generating smiles, and it is associated with supporting their community. There is no better way for them to generate positive public relations. So there is no reason to be shy when it comes to placing several Wells in your city. 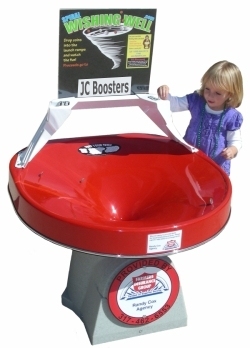 Some organizations begin with one, place it in a store, THEN get it sponsored, THEN show that one to other sponsors in advance of ordering more Wells. Therefore, all future expansion can be pre-paid! If you haven't already read the pricing page and called us to learn about the Project Kindness Grants (1-937-384-0003 New York Time Zone), if you are a non-profit organization or raising money for a non-profit, Project Kindness (PK) will pay for a significant portion of your Well(s). We encourage you to use that fact to your advantage when asking a local company to become a sponsor. For instance, you can say, "We have already qualified for a grant that pays for a large portion of the cost...we just need to find a local company to sponsor the balance." A prospective sponsor will see that as evidence that this is a great opportunity since grants demonstrate value assigned by a third party. PK does not seek any recognition on the Well, so you are offering 100% of the sponsorship recognition for only a portion of the cost. Click here to see a 1-page template that you can send or hand to parents, patrons, or others. This is the FASTEST way to get an individual or family sponsor. Some organizations have gotten a sponsor within an hour of sending this out! Look at the advertisements in your local newspaper and you will find many businesses who spend thousands of dollars each day on advertising. But they can't buy better exposure than you can offer on Spiral Wishing Wells placed in the best retail locations in your city. Mom's, Dad's, and their children will be standing at a Well having fun and seeing a sponsorship message such as, "Sponsored by...", "Provided by..." or "Made possible by your friends at XYZ Company..."
Car dealerships, real estate companies, cell phone companies, banks, soft drink bottlers, realtors, insurance companies, and every other kind of company that doesn't have its own retail space would love to sponsor some Wells...all you have to do is show them the opportunity. Car dealerships seem to be the most eager sponsors because they want to have a good reputation in their community. Also, they are locally-owned so they are able to make quicker decisions than a company that is regionally or nationally-owned. It is fairly easy to get a sponsor for one Well, but if you want to place several Wells throughout your city, be sure to offer them the exclusive chance to sponsor all the Wells you plan to place in your city. 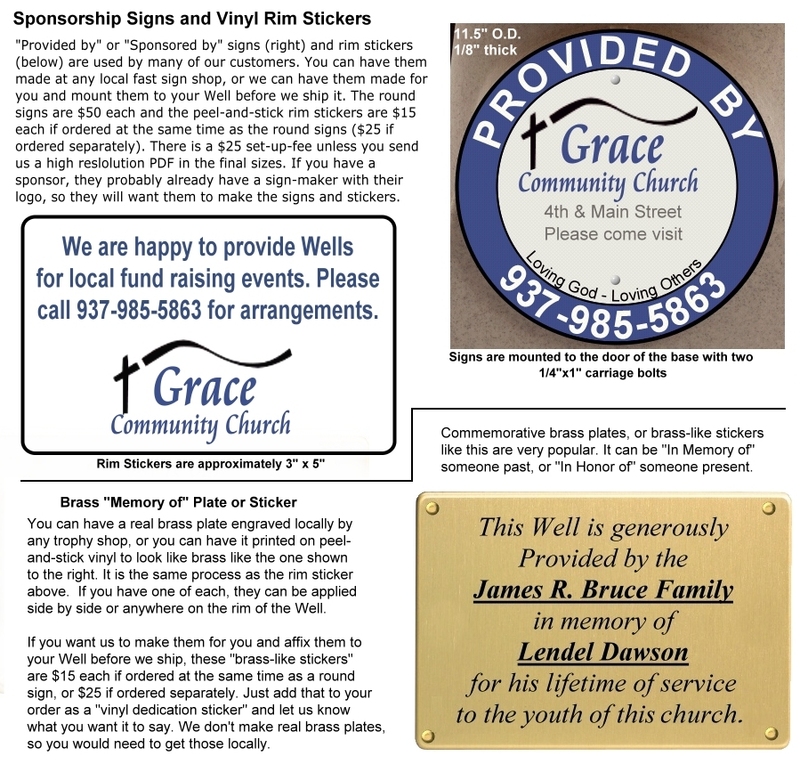 If advertising on one Well is a good thing for them to do, dominating the sponsorship of all the Wells in the city is even better, especially if they can, "prevent their competition from getting in on this new advertising opportunity for all time." Other industries that make great sponsors are the suppliers of brand-name products which are sold in the stores where you want to place Wells. For instance, if you want to place a Well in a grocery store, contact one of the breakfast cereal companies, soft drink suppliers, or pet food companies or distributors and ask them if they want to be a sponsor. The store can help put you in touch with some of the supplying Reps. But the easiest way to find a sponsor is to look in the newspaper or at local outdoor billboards and see who is already spending money to advertise in your city. Foundations - Another sponsorship source is local community foundations. Many cities have depository foundations where wealthy individuals and corporations donate large amounts of money to be used for community purposes. In Dayton, Ohio where our corporation headquarters is located, there is such an organization called, "The Dayton Foundation". In our Yellow Pages directory, it is listed in a section called, "Foundations—Educational, Philanthropic, Research, Etc." If you have a listing like that, you stand a good chance of finding a sponsor by making some phone calls and asking, "If they have any donors that might want to help raise money for your charity by sponsoring Spiral Wishing Wells that will be placed in stores and restaurants where name or foundation will be prominently displayed." Many of these donors are very interested in using these funds to benefit local charities and to generate a positive image for their corporation at the same time. They understand the concept of an "endowment fund" that generates investment income such as the Spiral Wishing Well which is fantastic at generating much greater returns than it costs. That's the kind of language to use with community-minded philanthropists. A question we receive often is about timing...when to present the opportunity to sponsor...before you get and place a Well, or after? The answer is that it is MUCH easier to get a sponsor when they can see the Well in action and producing smiles on people's faces. That is a great setting for a company to feature its name. In fact, when they see people enjoying themselves, they will get a smile on their face too! But it is very difficult to explain that effect with words and pictures. So if you can afford to purchase a Well from your budget THEN show it to a prospective sponsor, you will have much greater success. Based on our experience and the feedback from our customers for several years, it is probably a 10 to 1 advantage if you can show them a Well compared to showing them a picture. If you can't afford to do that, and if there is already a Well in another location in your area such as at a museum or zoo where the sponsor can observe it in action, that is definitely better than a picture. Of course, most of the hundreds of Wells in public institutions around the world have older models, and the new models are better in several ways. Nevertheless, they will be able to see the coin-spinning phenomenon. Some people ask us if taking the small toy model into a prospective sponsor will help. Yes, it will help. 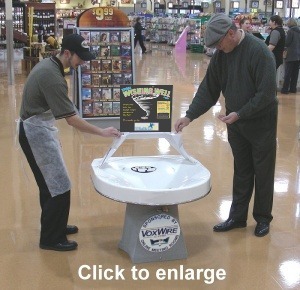 It is certainly better than a picture because they will be able to experience the coin-spinning phenomenon. But we don't recommend it because it is a far-distant second best to actually showing them a large Well that is already in a store. If you want to place several Wells in your area, after the first one is placed, you can line up several corporate sponsors for other locations using that first Well as your "active on-site demo." The sponsor usually makes their own sign. Most companies already have a local sign maker who makes signs for them. 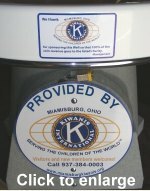 All modern sign makers use 4-color digital printing on vinyl and they also have 1/8" thick plastic like the 12" diameter Kiwanis sample sign. Then all you would need to do is attach it to the door on your Well(s) using 2 simple bolts and nuts. We recommend common 1/4"-20x1" carriage bolts because they have a round head that can't be unscrewed from the outside. You would drill a couple holes on the sign in places were they don't cover up the wording or logo. We can also have the sign/sponsorship message made by our sign-maker and attach it to the door if you wish. But that takes another week before we can ship your Well. So most of our customers just ask their sponsors to make the signs while the Well is being shipped to speed things along so they can start collecting coins sooner. 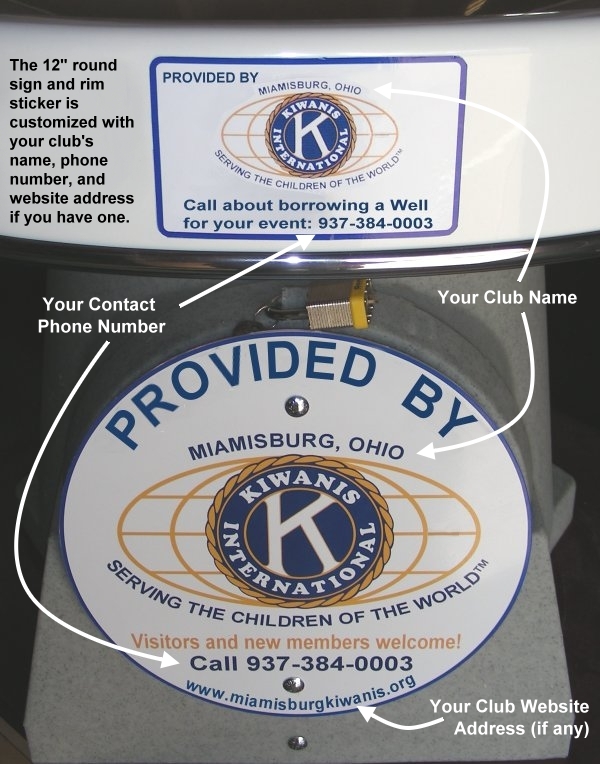 You can click on the accompanying Kiwanis image, and also click here to see even more details about the signs and stickers. Click here to see a letter/brochure that you can hand to prospective sponsors. (printable PDF) Remember, it is always better if you have already shown them an actual Well. But this document is something that you can leave with them. You can add your contact information on the bottom. Or, if you want a Word Document version of it, just let us know, and we will email it to you. Click here to read about one-time or short-term events and other promotions that can generate thousands of dollars. Read how a school raised $245,000 in 45 days. Click here to review a complete strategy with suggested wording about how to place a Well in a store that already has a prefered charity. Click here if you are interested in regional or national programs for stores, charities, and sponsors.